TOC of an enterprises BI strategy. Think about all of the costs associated with the hardware and the software located throughout the enterprise and all of the people trying to access the applications concurrently. Buying more processors, maintaining multiple server licenses, and deploying expensive personnel to support the products and tools got over the years only increases the wasteful spending especially if many of the products do not effectively work together. To significantly reduce the expenses related with a BI strategy, the organization must increase the ROI with a cost-effective solution that scales up to meet the growing demands for information. The best solution can be Web-based, without per user client licensing fees, and should not need any additional software on the client end. The enterprise has many types of users: casual users, more sophisticated users who make their own reports and analysts or power users who drill down to do Online Analytical Processing (OLAP). The functionality is vital and the entire enterprise has to be empowered to quickly and easily create all kinds of ad hoc reports, complicated queries, and in-depth analysis with nothing more than a Web browser. Rolling out a BI solution at the lowest TCO cannot be done if the solution has tools that need extensive training. Instead, the solution should consist of an intuitive environment that does not need plug-ins and is straightforward to learn and easy to use. The vendor that gives significantly less software prices and is also good with the hardware specifications should be located. To make sure of the best performance, the BI solution will have to use the Internet as the vehicle to drive data to and from all the levels of the users. Buying more hardware processors will not resolve the bigger issue of how to put up with the growing number of users which requires the accurate information immediately. A truly scalable BI solution needs less hardware and maintenance while addressing the needs of all the information consumers. When users will become self-sufficient, the costly IT resources can be redeployed from reacting to the many sudden business requests to implementing and integrating the strategic enterprise initiatives. The idea was to calculate the price related with the purchase, the deployment and the operation of BI solutions. Finally, choosing the least cost vendor in the biggest category of Business Intelligence with parameterized reporting and user defined reporting on both the Windows and UNIX platforms is an extremely cost-effective solution for large-scale environments. In some scenarios, it is even possible to save hundreds of thousands of rupees, for example, in the categories of 1,000 and 10,000 users, by choosing the least-cost vendor. The developer resources are expensive and the users will have to immediately access the information. Hence, the developers need flexible tools to quickly build and deploy the complicated BI applications throughout the enterprise which can meet different user preferences for greater ease of use and maximum productivity. Choose the BI solution with an open and intuitive environment which will allow the quick development of almost any type of Web based report or information system. The users should be ready to access the right information to do the analysis and also to create reports. But are they prepared? Keep the time and costs related with training the diverse groups of users at a minimum in order to make sure the lowest total cost of ownership. Empower the organization to immediately access and analyze the data in a way that is best suited to get results and also meets the needs of executives, partners, customers, and sophisticated analysts. Next is to make sure that the people can easily manage and share information throughout the enterprise and the results can be saved, viewed, printed, and taken offline for additional analysis. As the usability increases, the BI solution becomes more valuable, thereby increasing the Return On Investment2. Maintaining an environment where the valuable IT talent can handle every simple user request which will increase the TCO. Reducing the amount of maintenance and support required throughout the organization by increasing the user self-sufficiency. Choose a reliable and manageable BI solution in which the users can instinctively help themselves to the right information, perform simple queries, and create or change the reports. Then, the IT resources can be deployed to solve more complicated problems. Throughout the organization there are important business intelligence investments that should be leveraged. Rather than haphazardly removing these assets, particularly based only on the price, the focus should be first on removing the unwanted data and the overlapping technologies. Then minimize the difficulty of systems and consolidate the server resources to make sure the interoperability. The main objective is to increase the operations by empowering users to ably access and manipulate the information, at the cost of very old or duplicate tools. Using the information intelligently throughout an enterprise will improve the performance, propel the productivity, and reduce the costs. A fragmented BI strategy is regularly the result of having multiple tools deployed and working independently of each other. The studies have shown that the approach is very expensive and can create problems such as stove- piped views and data inconsistencies among the departments or groups. Control the assets already owned and choose the BI solution that interoperates with the assets and the data to lower the TCO. TOC is used to recognize the costs associated with developing and operating the BI programs and components. The TCO gives valuable data which can be used to decide the Return Of Investment (ROI) of the program. The conventional TCO approach addresses the visible costs related with the BI, which means that it usually focuses on the hardware, the software, the telecommunications and the development and the support of personnel expenses. This approach leaves out an extremely important component, and many clients have struggled to validate moving to an enterprise data warehouse because the component was deleted. The missing feature is the time and hence the price of the business analysts who can use the information. Instead of using the traditional approach, the companies should emphasize the TCO management of the information delivery. This slight change in the terminology expands the scope from the technical environment to the business environment and indicates that with the addition of the term management action should be taken based on the cost data that is captured. To understand the affect of including the business analyst’s time the example of the company trying to rationalize the passage from a data mart environment to an enterprise data warehouse or to the development of conformed dimensions. If it calculates the TCO using the tradition approach, the enterprise data warehouse conformed dimensions appear to be more costly. Without exceptionally strong executive support, such a project would not be perceived as being cost justified. With the proposed approach, the time business analysts spent in capturing, validating, recording, and correcting the data should be included. It is not uncommon for these analysts to spend a main portion of the time on such activities, leaving only a little portion of the time to actually use the information. The enterprises approach the information capture and reconciliation by combining it into one source and the information validation and correction by treating data quality in Extract, Transform and Load processes. 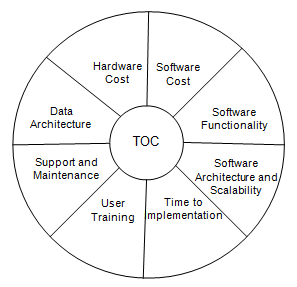 Measuring the components of the TCO is crucial if we are to manage it. Ideally, capturing the actual time spent by the business analysts on the information delivery activities, and also the information, cost components would be available. In most of the companies, this is not practical. Hence, there should be another approach for capturing these costs. · What is the percentage of the time spent searching for the information? What is the specific data which is difficult to find? · How many sources of information have to be used to capture the information for the most common analysis and reporting activities? What kind of data has the most sources, and what are the sources to be used? · What percentage of the time is spent reconciling the data obtained from the multiple sources? Which data is the most difficult or time consuming to reconcile? · What percentage of the time is spent reworking on the analysis because of the data errors that may be discovered? Which data is most prone to such errors? · What is the percentage of the information analysis and delivery time which could be saved if accurate, reconcile, trust worthy information were available from a single source? What improvement if any has been experienced since the last survey? The TCO management gives one set of measures which will help to understand the value of BI. Other success measures which are both objective and subjective should also be tracked. Some of the success measures to be considered include the usage levels, user satisfaction, observable data quality issues, the reuse levels and, eventually the business value obtained. Managing the TCO for information delivery is an important success factor for a BI program. This consists of the costs necessary to go beyond the traditional visible expenses and should address the effort people spend while changing the data received into useful information which can be applied to the business value.